Check the Internet connection (for example, open the www.kaspersky.com website). Make sure that the date is correct on your computer. If the system date is incorrect, fix it. Add the activation code which contains only Latin characters and numeric digits into the Activation window. Check if the keyboard layout is correct before you enter the code. If you don’t see the Activation window or if you closed the application after installing it, launch Kaspersky Total Security 2018 and click the link Enter activation code in the lower-right part of the main window. In the window with the notification of successful installation, click Finish. Save your activation code in a secure place (for example, store it in your account on the My Kaspersky portal). For detailed information about activation codes and licenses, see this article. The trial license allows access to all application features, but its term is limited to one month. You can use the trial license to evaluate the application. After the trial license key expires, database update will become unavailable. You can download a trial version from the Kaspersky Lab official website. Trial license activation is unavailable if it was activated before or is still active on the same computer. You cannot use the trial license if you have activated the application with commercial license before. If you have Kaspersky Anti-Virus 2018 installed, you can still activate a trial version of Kaspersky Total Security 2018. If you would like to continue using the product after the trial license expires, buy a commercial license. In the Activation window, click Activate trial version of the application. 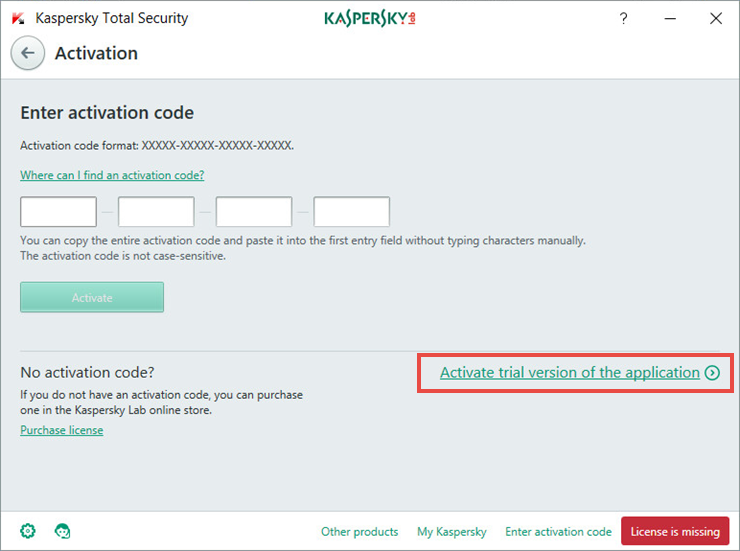 If you cannot find the Activation window, run Kaspersky Total Security 2018 and click the link Enter activation code in the lower-right part of the main window. In the window with the Activation completed successfully notification, click Finish. Each copy of a multiple-device license for Kaspersky Total Security 2018 is installed and activated in the same way on all computers you want to protect. To activate Kaspersky Total Security 2018 on all computers, use one and the same activation code you purchased. Kaspersky Password Manager (Windows / Mac / Android / iOS). Kaspersky Safe Kids (Windows / Android / Mac / iOS). When new versions of Kaspersky Lab products are released, you can use the code for Kaspersky Total Security for their activation if it has not expired yet. During the activation, you may encounter error messages, for example "Incorrect activation code" . You can find instructions on how to solve issues in the General articles: Activation errors section. If the issue persists, send a request to Kaspersky Lab Technical Support via the My Kaspersky service. In your request, give a detailed description of the problem. For more information about My Kaspersky, see the Online Help page.